My mother had surgery recently and my kids wanted to send their Nana some flowers while she was in hospital. Now while flowers are a lovely thing to receive, they can be quite expensive and let's face it, they die! My mother is also highly allergic so it was an all round bad idea. 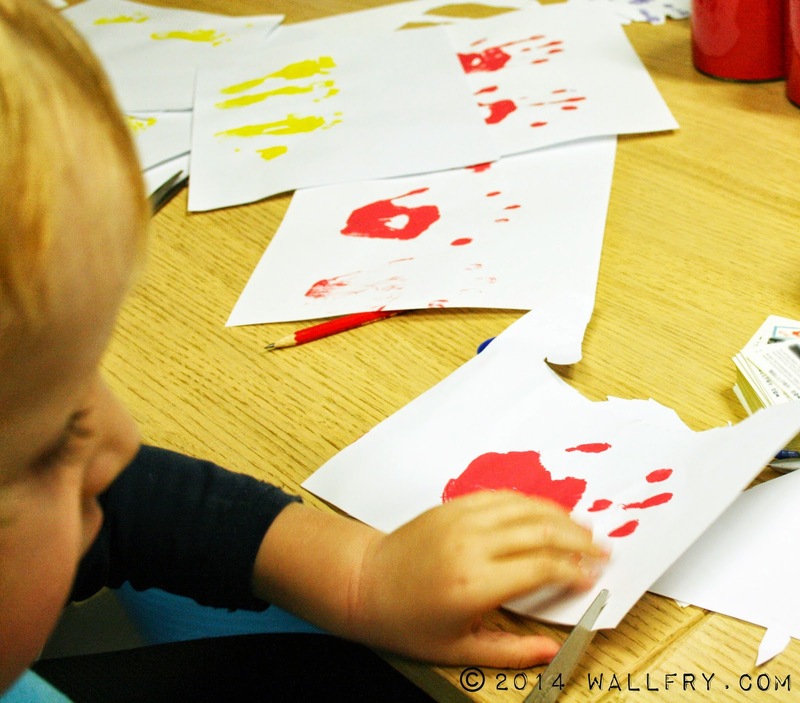 Hand prints work best when you paint the hand and they then stamp the paper with it. Dipping in a tray of paint might sound like a good idea... it wasn't. While you can use whatever color scheme you like, I found it easier to keep it to one color per child (they chose their colors). That way I (and Nana later on) could identify which hand print belonged to which child. I now know that it is near impossible to get a hand print from an 8 month old. Foot prints, while still difficult to get without help (shout out to my very helpful 5 year old) were much easier and looked great mixed in with the hand prints for a bit of added interest. I added the 'leaves' for a bit of color and authenticity. The boys and I just cut these from colored paper. When the kids go to wash the paint off their hands, make sure that they don't make a stop at the toilet on the way because they 'forgot' (we won't mention any names). You will find paint in places you didn't know it was possible for paint to go. The hand / foot prints don't need to be cut out perfectly. 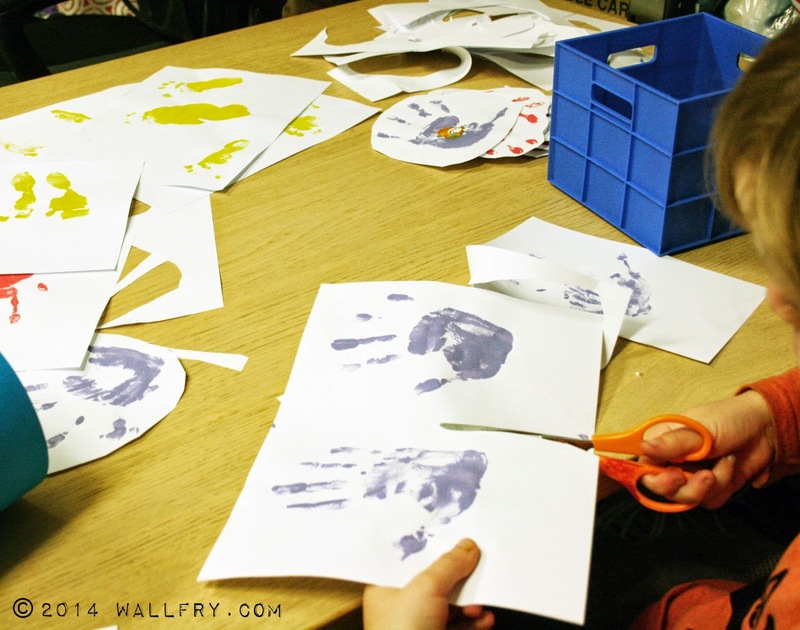 The rough border makes them quicker and easier to cut, it keeps them sturdy and it means that the kids can get involved and help with the cutting too. I also like the effect. 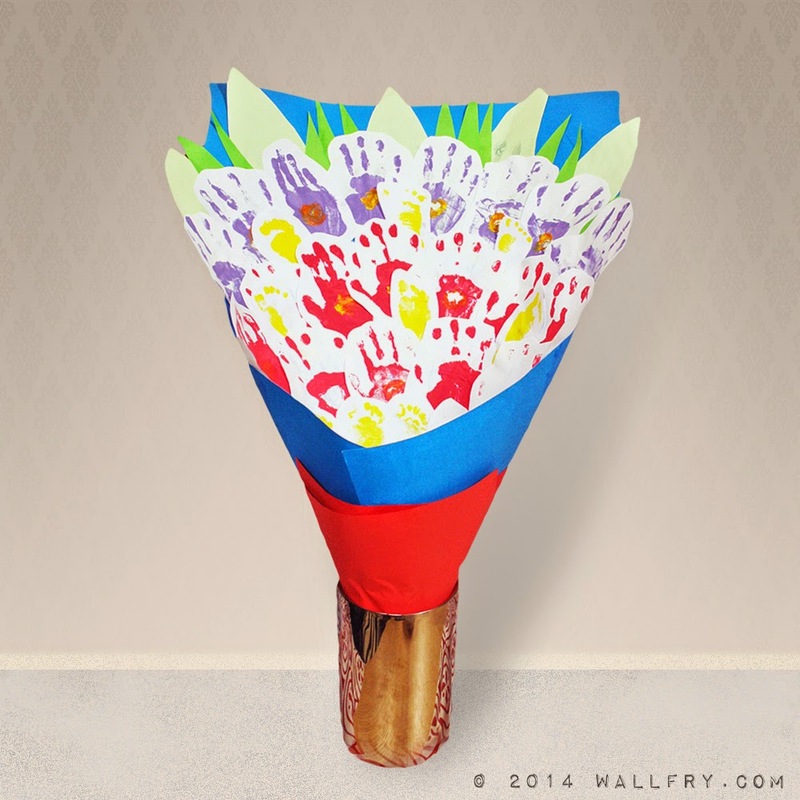 Once you have all your flowers hand/foot prints you can then arrange them. Work out your bouquet / paper sizes first so you know what you are working with. 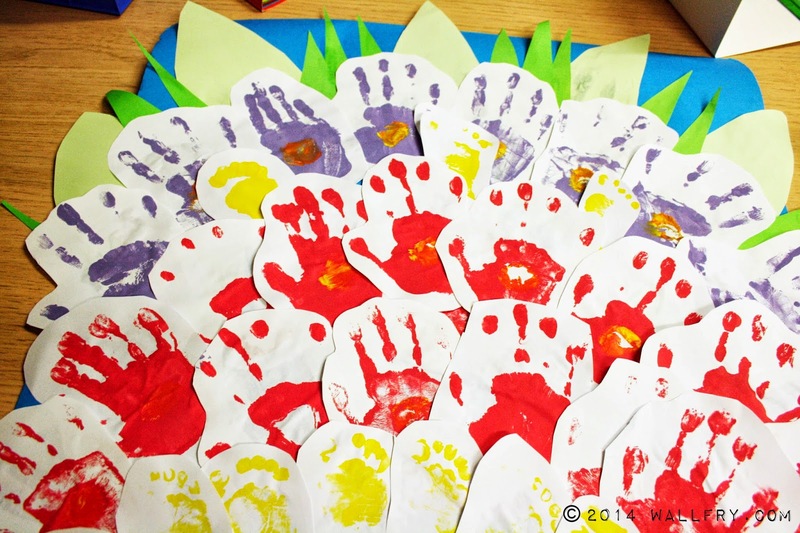 This can be done on a large scale (ours was pretty big on an A2+ piece of card) or much smaller (the one I received from kinder was on an A3 size). I just used Clag (paste for paper and card) to stick them on but any craft type glue would work, it doesn't need a super-hold. It might be hard to visualise what the flat arrangement will look like when pulled into a cone shape. I kept picking mine up and curling it to get a better idea. 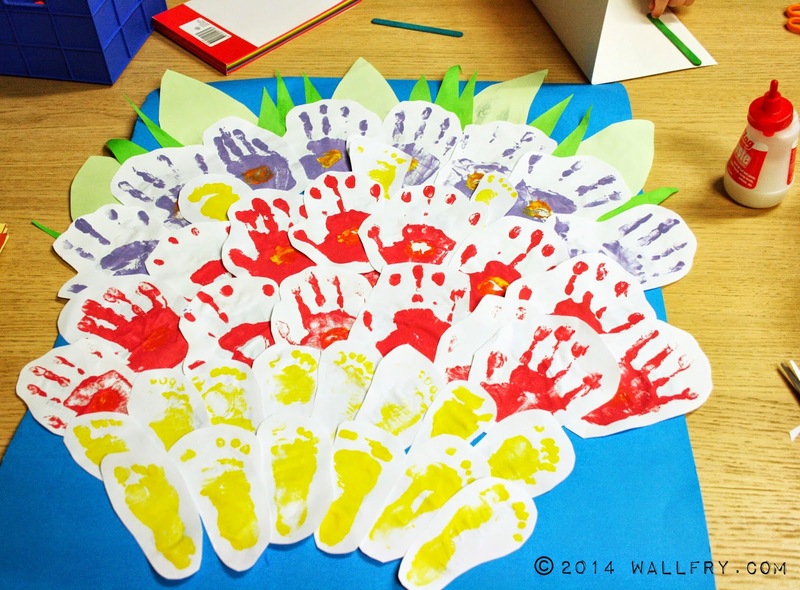 I also liked letting the hand prints stick up over the card base to give more of that 'flower' effect. As you can see the hand prints don't need to be perfect or uniform either. 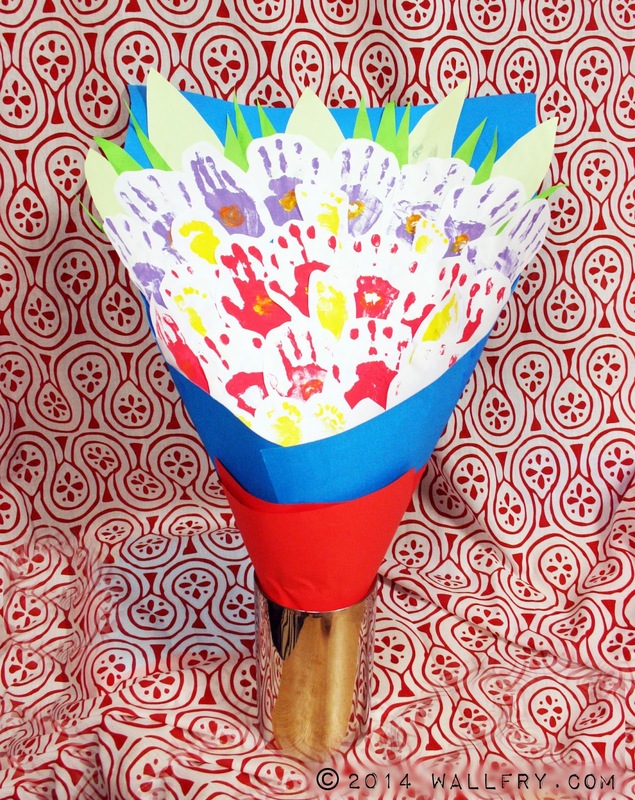 Once you are done and your glue is dry you just pull your base card paper around at the bottom into a cone/bouquet shape and stick (or staple for a stronger hold). I then also used a contrasting colored paper wrapped around the bottom of the bouquet, florist style' to hide my joins, which I thought was a nice effect. My mother absolutely loved this gift and I did too when I received my smaller version. It is thoughtful, hand-made, representative of the kids / grandkids and is something to treasure for longer than the usual week that actual flowers last. This is a super-easy DIY that the kids can get involved with, which makes it all the more special for the receiver. It would be a perfect gift for Mother's Day, a get well gift, or any gift for a mother or grandmother who cherishes their children. What is it with superheroes? 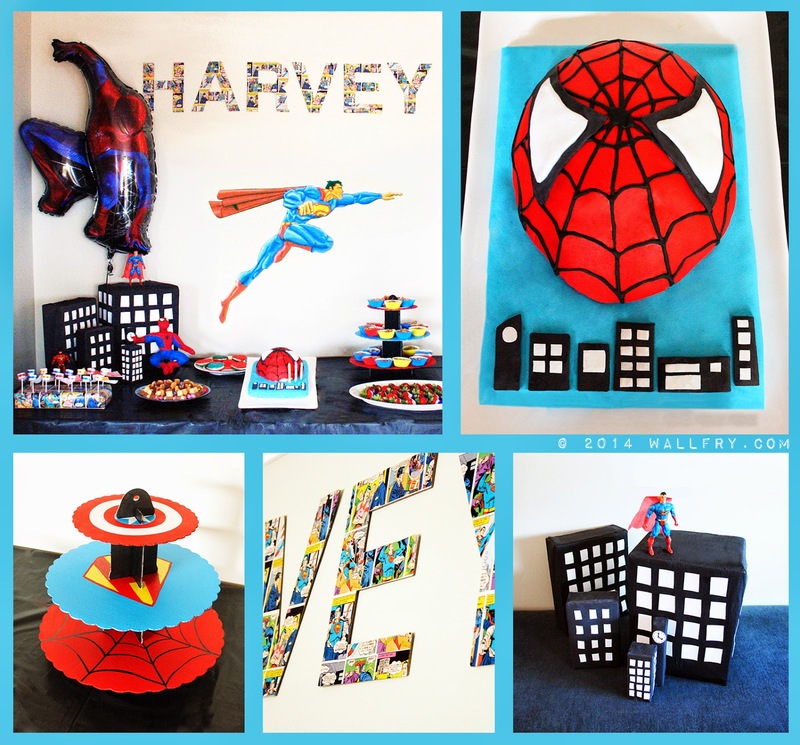 My 3 year old son had never seen a superhero TV show or movie, had never read a comic or book, had never seen a superhero in action at all and yet he desperately wanted a superhero birthday party for his 4th birthday (well he actually wanted a 'Spiderman' party but we gently suggested that it might be nicer for guests, not to mention easier for us if we included all heroes of the super nature). This was the first party that he was really old enough to choose for himself so what master 3 turning 4 wants, he gets (well he got the party anyway). 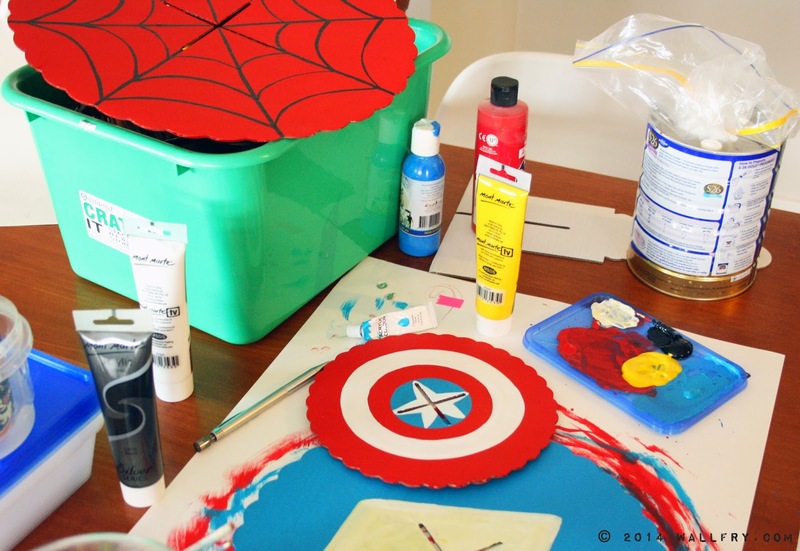 It was really hard to find inspiration for superhero parties on the Internet so I thought I would share our very easy, low cost DIY superhero party! It was a great success with some showstopper moments. 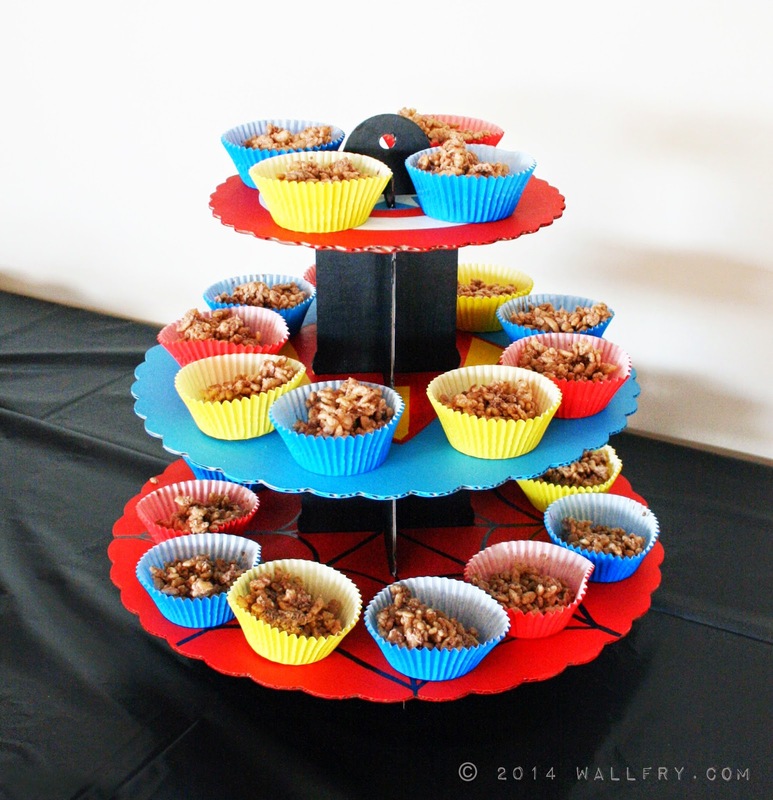 This was my first real 'theme' birthday party and I had so much fun with the planning and organising. Everything was kept pretty low-budget and DIY - most of these kids were only 3 or just turned 4 so we kept the focus on making it as fun as possible without too much fuss. The Spiderman cake I made myself using some great tips from tutorials from around the web (pun intended). 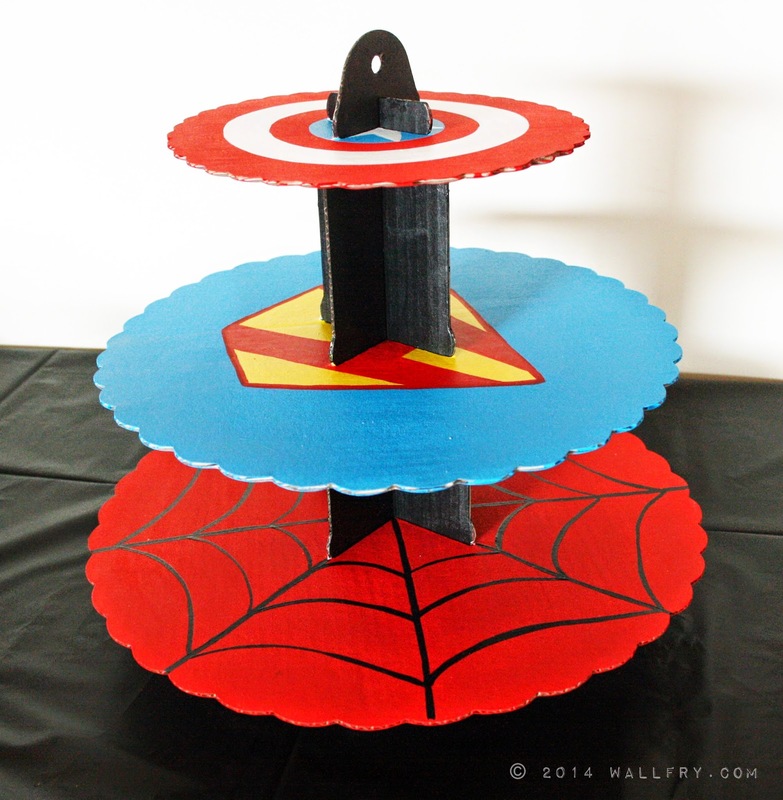 More on that here: Spiderman Cake! The name was also DIY. I just used cardboard letters and pasted on some cut out comic strip gift wrapping paper that I found. Super cheap and easy! So with the table taken care of, we could focus on making this party fun. We had it at our home and luckily have some space in the backyard where the kids could run and play, which to be honest, would have probably been enough at this age BUT, this is a party, there is no such thing as enough! Pin the spider on the Spiderman - again another DIY where I just got a Spiderman poster and... well you get the drift. Pass the parcel - wrapped in that comic strip gift wrapping paper that I used for the letters and with a superhero themed goody in each layer. Make your own mask - we also had a table set up where kids could make their own masks. Remember that these kids are 3 so it was important to make any craft activity something simple with instant reward (eg stickers better than waiting for glue to dry etc) otherwise the parents end up having to do it for them. 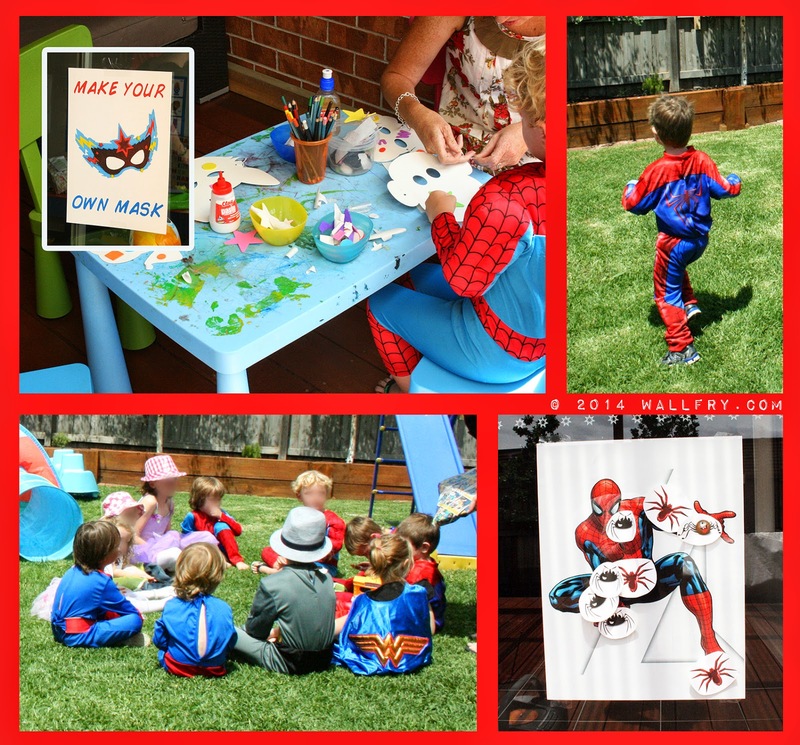 The kids DID have fun with these games, BUT the most memorable thing about this party was a personal visit from Spiderman himself. ...yes, that is my husband in a Spiderman suit (purchased online for a very reasonable price). 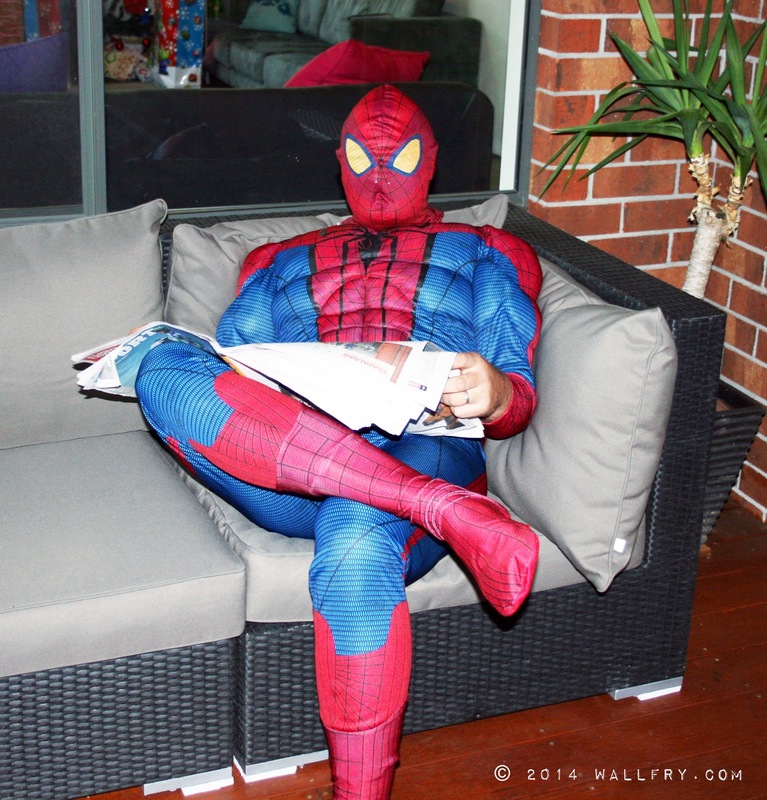 You may not have been fooled but the kids sure were and they were SO excited that the 'real' Spiderman had come to Harvey's party. The celebrity visit was planned perfectly and came off without a hitch. First we called out to the playing kids that Spiderman had called us on the 'spider phone' and needed all the 'creepy crawlies' cleared from the yard. This then segued into a scavenger hunt for little plastic bugs and critters that had been strewn around the yard in advance. They had to fill a central container with the bugs (teamwork) and when they did there would be a surprise at the end. The kids loved the scavenger hunt, but we keep finding those little plastic bugs, frogs and snakes throughout the garden which has caused a sharp intake of breath on more than one occasion. Once the container was full, the Spiderman theme song started playing and in ran Spiderman (husband took the opportunity to get changed in secret while the scavenger hunt was on). He had cans of 'silly string' and sprayed 'spider web' all over the kids. They were overcome with squeals of delight. Spiderman was on a timeframe, that suit was hot (not to mention a little tight) so we had an activity planned. 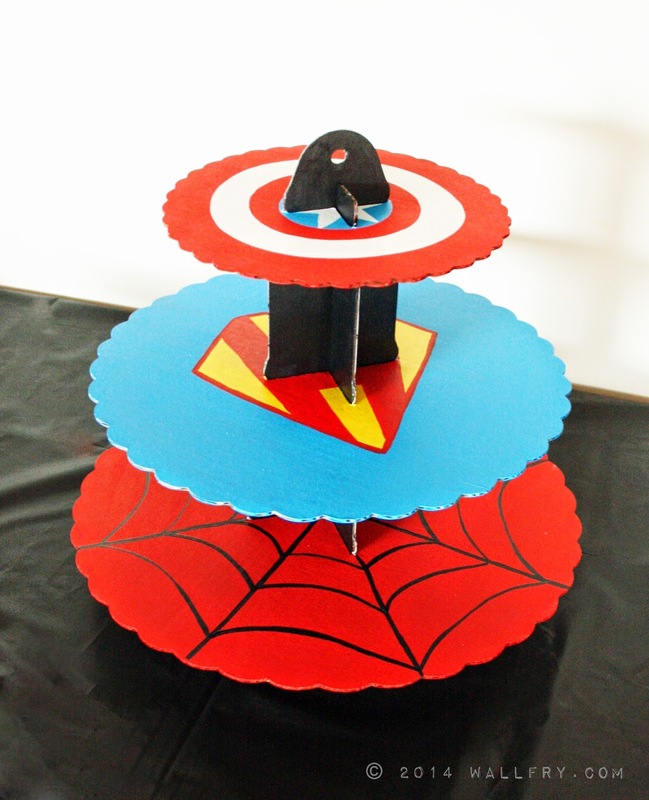 The little superheros were going to have to cross an obstacle course, lead by Spiderman, so that they could return to head quarters and enjoy the birthday meal. We used slides and swings and crawl tunnels etc, just toys and play equipment that we already had. Once the obstacle course was successfully crossed by all little superheros they sat down to eat a birthday lunch. Spiderman had a (very small) gift for them all before doing a magic trick (using his superhero powers of course) before he left. The magic colored water trick was the easiest, most effective thing to do and it blew the kids minds. Spiderman announced he was going to fill their water jug with 'magic spider water', then took a jug of clear water and poured it into another jug at which point it turned blue - cue the gasps of amazement and pure awe from the kids. The trick is to put the smallest amount of food coloring in the bottom of the second jug. The kids don't see it as they are paying too much attention to Spiderman and from their perspective the water just turns blue by magic (you will need 2 clear jugs for full effect). In the wake of the awe of 12 tiny superheroes, Spiderman then made his exit. The party was a huge success. 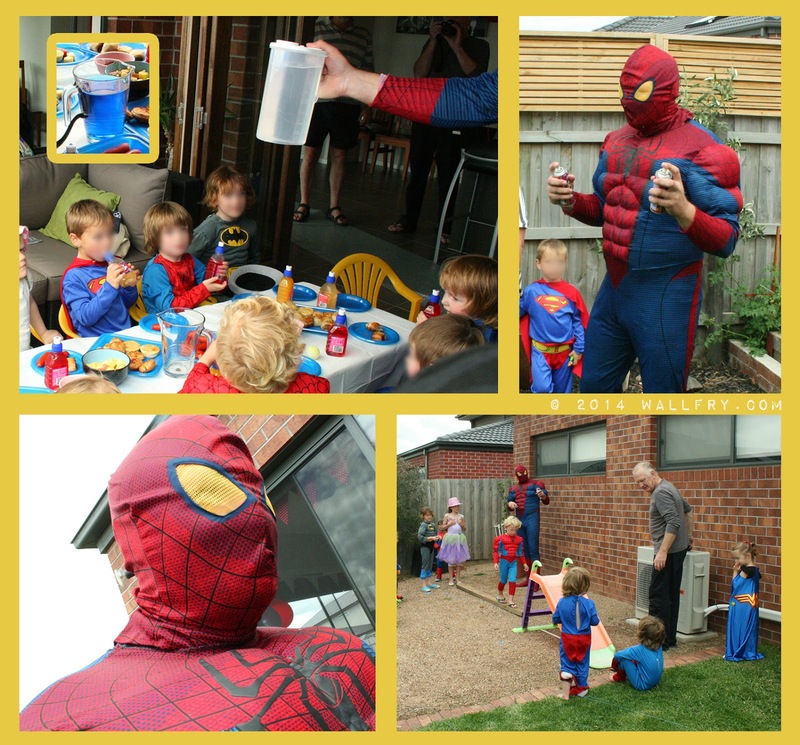 My kids still think the real Spiderman came to Harvey's 4th birthday and although I am sure they will work it out eventually they currently think it was the coolest thing in the world. Thanks Spiderman. Preparations for the 'Superhero' party for Mister 4 are in full swing and, let's face it, the creative juices are well and truly flowing. I purchased a super-cheap plain cardboard cupcake stand (the type you put together yourself), and just painted my superheros of choice. I used some paints that I had around the house to create the perfect stand to match the party theme (and colors). I know that you can get some 'superhero' themed ones of these ready-made, but the only ones I could find were either super cheesy or super violent. I chose the three superheroes (my sons' two favorites and one to match the color theme) and went to work. It was a bit more work than I expected (it took a few coats to get the colors bright enough) but I think it looks pretty cool. I was a bit reluctant to cover it up with my version of 'cupcakes' (chocolate crackles). If you would like to enter, tag a photo of your flashy furry friend on Instagram with #wallfrycomp and you will go in the draw to win a Wallfry dog print of your choice.